The Great Barrier Reef is home to more than 500 species of marine plants known as algae. Algae have been part of the marine ecosystem for more than two billion years. Marine algae generally come in brown, red or green forms. Although they are classified as plants, they lack the roots, stems and true leaves of land plants. 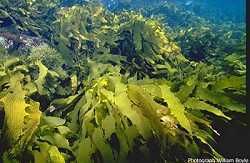 Larger algae are commonly referred to as seaweed. Like other plants, algae rely on sunlight to internally manufacture food and grow. Many marine algae contribute to the Reef's overall structure. By growing between coral fragments and rubble, coralline algae help to bind the Reef together. Limestone-producing algae also make up a major component of the Reef's sand when they die and breakdown. Plankton algae have an important role in nutrient cycling in Reef waters. Inshore reefs often have an abundance of algae on them. Marine plants dominate the Reef as nutrient cyclers, builders, binders and sediment producers. invertebrate species like lobsters and abalone. Blue-green algae are microscopic and can form a reddish slick on the water's surface (often called red tide) and are common in Reef waters following calm weather. Blue-green algae may also form blue-grey slimey areas on the coral reef surface. Red algae are the most common larger algae found in coral reef environments. They include calcareous types, which form a hard coating on the Reef surface. The algae usually grow in shaded areas or under coral rubble. They have a major role in cementing the reef structure together. Brown algae are abundant in cooler climates, such as in kelp beds, however a few species can be commonly found in the tropics on inshore reefs. At some sites and times, these large algae may shade adjacent corals so they cannot be seen easily. Zooxanthellae are also a type of algae and are one of the most important organisms on the Reef. Zooxanthellae are tiny plants that live within the tissue of many marine animals, such as corals, directly providing them with their nutritional requirements. Zooxanthellae are essential for corals to survive and grow, building the structure of corals reefs. Some damselfish farm algae on coral heads for food. The fish nip the coral to create cuts that encourage the algae to grow. Nutrients provide food for marine algae and help them to survive, grow and reproduce. The increased nutrients being released onto the Great Barrier Reef through run-off from coastal development and human activity may have led to an increase in the amount of marine algae in several areas of the Marine Park. These 'over-fed' algae can out-compete corals, robbing them of the light they need to survive. They can also adversely affect seagrass in a similar way. Marine algae can be affected by natural events such as cyclones, and from human impacts such as land run-off and habitat disturbance. The major impact on algae is water quality change caused by land use and agricultural practices adjacent to the Great Barrier Reef . 9 I live in the sea: Sharks & Rays - they're more scared of us!